Stayed here for 5 nights whilst exploring area and walking up Ben Nevis. Most of camping area is on a slope but flatter pitches can be found. Ground tends to be saturated/waterlogged if there has been recent inclement weather. When the sun does come out it is a glorious place to camp. Great facilities, showers etc, laundry room to dry your gear, camp shop (bit pricey for some things), take-away hot food van open daily (recommend deep fried haddock in batter). Only 2.2 miles walk from Fort William for backpackers to get there. Wonderful views of Ben Nevis and other peaks, lovely river side walk on other side of River Ness (footbridge by Youth Hostel). All in all, one of the best campsites I have ever camped in. Highly recommend it. Wonderful site, great location, great facilities, lovely bar / restaurant, great shop and I could go on. Myself, my partner, 12 year old and 2 dogs. Trust me we ALL had a great time. Will definitely stay again. Stayed once before and was equally impressed this time. It's a big site but organised in a way that doesn't make you feel hemmed in. Facilities are excellent and the shop has everything you could want. Easy cycles up the glen and into Fort William. Great, easy access to Ben Nevis which we did with the kids. We were blessed with wonderful weather in October so no midges. Would recommend the Ben Nevis Inn for drinkies or nosh. It's in an old barn further back down the glen, across a footbridge from the main visitor's car park. 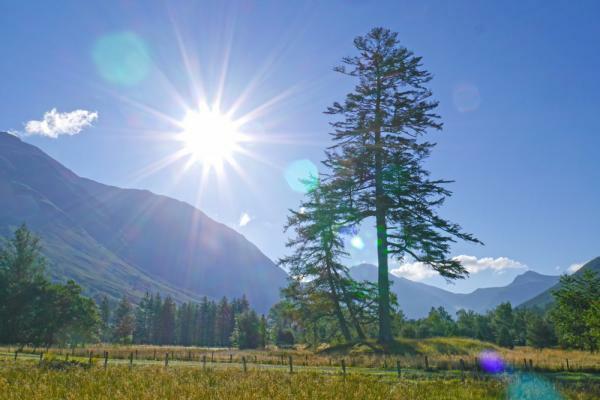 EXCELLENT LARGE SITE CLOSE TO BEN NEVIS AND FORT WILLIAM. IDEAL FOR EXPLORING WEST HIGHLANDS.RULES AND REGULATIONS ALLOW FOR A PEACEFUL NIGHT. 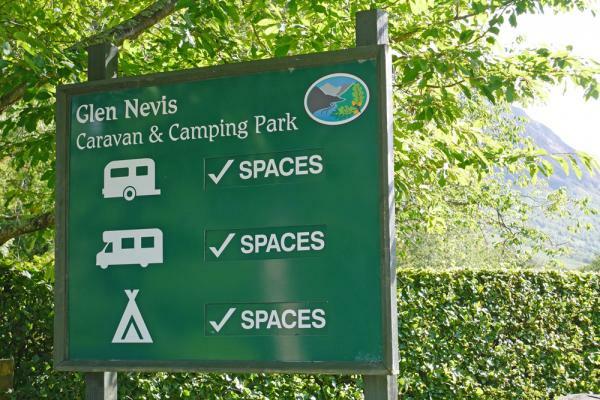 Add your review to Glen Nevis Caravan and Camping Park with the form below. This was a brilliant camp site, highly recommended, great for all ages. We pitched a two man tent for two nights for £27, bathroom and wash facilities great with lovely warm showers and hair dryers for the ladies. Perfect spot for doing Ben Nevis with great options for food and alcohol after a good old walk. We will return here and recommend to our family and friends. Thanks for a lovely chilled out stay. Easy to get to for cycles from Fort William town (2 miles). A great base for Ben Nevis and the West Highland Way (we did Ben) as well as just a stop off. The facilities were great, very clean. Staff are very helpful. Price for 2 cyclists and a backpacker tent was just £13. We stayed for 3 nights (2 initially but was simple to add on the extra day). Good stocked shop on site. And there are tumble dryers, washers and a spinner all of which are relatively cheap, but unfortunately no drying room - a shame when it's such a base for outdoor activities (that was our only gripe). Other campers are a mix of families and walkers, but overall generally very quiet and easy going. Would definitely stay again. Huge campsite, and gives the impression of being very much a business. Welcoming and efficient, it was so big that people didn't really talk to each other, and a lot of people in my field were there for one night too. Very midgie as expected. Probably the best facilities we've ever encountered on any caravan site. We didn't book, just turned up and the staff were lovely and welcoming without too many dos and don'ts. This is a massive site but it doesn't feel like it as it's split into sections. All caravan pitches are hard standing with an nice outlook onto a large grassy area. Electric hook up is right at each pitch. Showers were phenomenal and free. Loads of hooks, a wee seat, shelves for your stuff and a raised bit to dry off in. And it was normal taps so you didn't have to keep pushing a button. Hairdryers were also free. The whole toilet/shower/laundry/dishwashing blocks were just fab. Bins were emptied regularly and the whole place was spotless. Shop onsite stocks just about everything from interesting books to midge repellant and fayre from local butcher. There is also a chuck wagon which is open in the morning and evening which must be loved by soggy campers. We had fab chips, fish and macaroni cheese from here one night. Location is spectacular, just a short walk or cycle from FW town centre and with the great outdoors right on your doorstep. Minus side - only things that the campsite cannot alter - the midges and the rain. Would definitely come back in fairer weather to do the hills. I stayed at this site in September 2010 and it was perfect in every aspect. As it was getting on in the season, there was plenty of space for me to pitch my tent and there was never a queue for the showers in the morning. I arrived at Reception five minutes after they had closed, but Margaret booked me in and made me feel most welcome, even though I was apologising for keeping her from going home she insisted it wasn't a problem. Even though it was late September, it was nice to see the warden doing his rounds at night so late in the season. A special mention has to go to the site cleaners who do a sterling job, no matter what time you visit the toilet facilities, they are always spotless, even at night! I will definitely be returning to Glen Nevis next year, as it certainly beats everywhere in terms of scenery, cleanliness and friendliness. Top marks all round! best campsite we have ever been to. views are stunning, site is great, facilities top notch. will be back. Stayed here for one night at start of august 2010 with family. Campsite very well kept, staff friendly and helpful. Pleasantly surprised that there was only a few midges about. Toilets block near tent very clean and modern with five showers and plenty hot water. On site shop well stocked with food and camping equipment only gripe would be that it didn't open until 8am. Lovely campsite in a beautiful location and will definitely be back for a longer stay. Great site! Arrival was swift, here's a map, you can go there, there or there. Chose Ben View field because of the name. Plenty room to choose the perfect spot. Was a bit more sloped than we realised, as we woke at the bottom of the tent each morning. Our fault, not campsites. Pub/restaurant 5 mins walk, pub good, restaurant a tad expensive for what you get. Showers on campsite scarce, only 2 in nearest toilet block, which meant a queue every morning despite campsite not being particularly busy. Notice says to go to other blocks if its busy, suspect they'd have the same queues. A few midgies going about, actually millions of them, was a problem when it was calm, not when there's a breeze. Again, out of campsites control. Fort William 5 mins away by car, Morrisons, Tescos, restaurants, pubs, outdoor shops, station, etc. Will return. Great location, excellent facilities but spoiled in my view by a "rules culture" paticularly with regards to niose at night. The strict no noise rule meant that chatting with friends in the awning at barely 11.05pm was met with a visit by the site guards oops sorry wardens. Been caravaning for the past 30yrs and know how sounds can carry ( no music only chatting) but this rather spoilt the visit. The site is huge and perhaps a section can be laid aside for those that want absolute silence. This way everyone is catered for otherwise a good place to visit. 10 of 19 found this review to be helpful. We stayed here for 5 nights in summer 2008. It had been pretty wet just before we arrived and the ground was soggy, to say the least! We chose a spot tucked out of the way but had a 50m walk to the car which is really no hardship (though it is nice to park the car right next to the tent if you get the chance) and we could easily have picked a spot closer to the car. The site is very large and could get very crowded at the height of the season if the weather was good. The facilities (showers, toilets, shops, etc.) were good but I wonder how they would cope if it was really busy. The location is stunning with Ben Nevis towering over the site (when the mist clears long enough to see it!) and the midges weren't too bad. A good site but I prefer something slightly wilder and smaller. Stayed here an overnight in October 2009 to climb ben nevis. Weather not so good however campsite catered well for our needs. Fabulous location just at the foot of the mountain and the facilities were up there with the best I have saw in terms of condition and cleanliness. Would definately recommend and am planning on returning next summer! Had a fantastic weekend here to celebrate 35th anniversary. Although wet and windy kept amused by the number of people clambering up and down Ben Nevis head lamps flashing. Had a lovely day in Fort William, plenty shops and pubs etc. Had a fantastic meal at the Glen Nevis Restaurant, a short walk away. Good walks for dogs etc of which we have 2. Will certainly return, hopefully soon. Stayed here this weekend and had a great time. Excellent views and location with great facilities. The staff were extremely friendly and efficient. Will definately go back. 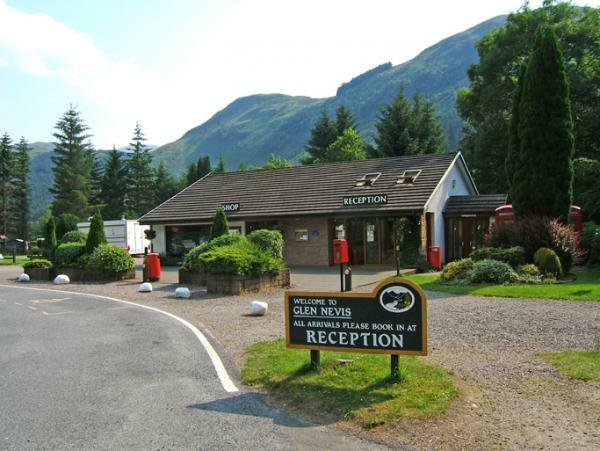 Not long back from camping at Glen Nevis, what a fantastic time my husband and I had there, a home from home, well maintained, clean toilets & shower, even a hairdryer in the block, will definately go back. Shop slightly pricey but that didn't dampen our spirits! Thoroughly enjoyed my time there. We stayed for 4 nights from 9th-13th June 09 Awesome camp site well worth a visit. Midges were a bit of a pain Avon skin so soft oil spray did the trick. Please visit the lounge bar and the food is very nice. The Ben Nevis cable cars is a must even for people in wheel chairs, what a great day we had. Fort William town has everything you need. Morrisons, Ldle, Mcdonalds. Well worth a trip. Absolutely awesome! great 2 nights sleep though the second night might have been due to climbing that little hill! Excellent view of Ben Nevis from the site, and pretty cool views of the site from Ben Nevis too! The staff are friendly and welcoming whilst being helpful. The Best shower's we have ever had after our jaunt. Would recommend it to everyone, been on numerous occasions now and looking forward to returning again shortly as it makes a good change from touring those "Other" kinds of campsites. Fun for all but not at the expense of other...Brilliant and thanks for our wonderful times there. I camped with my 2 sons aged 10yrs and 14yrs and west highland terrier in April this year for a few days of adventure. I dont know who enjoyed it more. The boys loved the freedom and space of the campsite and me and the dog were in heaven. If you want to unwind it a beautiful location it is so the place to be. We were very lucky with the weather as you can be sure of one thing it tends to rain in Fort William. The campsite has fresh water taps, great facilities, the staff are very friendly and the amenities are clean and well maintained. 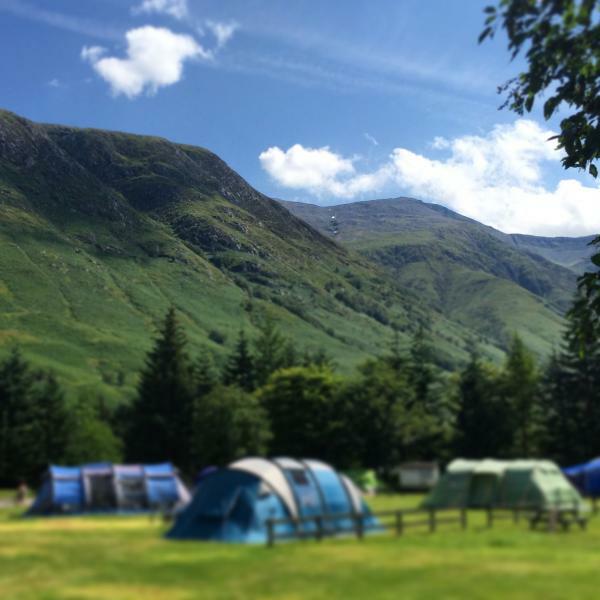 Glen Nevis campsite is a fantastic base to explore Fort William and surrounding areas, which are stunning. There is something for everyone. Cant wait to go back. We have been on this site a few times each year over the past few years, may be a little more costly than other sites however where else do you get such a spectacular setting with the facilities at hand. My son was made more than welcome with all the staff who answered any questions he had about the area. A few people complain when its wet, it is the west highlands and we are in tents???? Always recomend the site to others and plan to go again this year. Cherry trees, multi-coloured rabbits, a pub/restsaraunt all within walking distance, and Highland cattle stopping our vehicle, what more do you want from a campsite in the highlands of Scotland. Oh, and at the foot of Ben Nevis (if you can see the summit your too far away). Take this as your first trip to the Lochaber district and be pleasantly surprised.We used this as a base to do all sorts of family based activities. From Fort William station you can take the Harry Potter/Hogwarts expresss to Malaig but book first. Sure the midgeis are bad. Get a good supply of"SHOO" or whatever its called now and don't let the devils worry you too much. Al our kids got on with the other kids and there are wardens to keep the noise at down when the night gets late. Yes there are facilities such as climbing frames etc for children, but this is a family friendly park. It is easy to find, and the layout although large is very simple to negotiate. There are enough facilities for everyone but as usual everyone wants to use them at the same time, but we found there is little waiting time. Fort william is 10 minutes away by car but at least 30 minutes away on foot but there is a bus srvice. As with every campsite be patient and take some time to enjoy the surroundings, we have been there many times and look forward to going again and again. Oh, and did I mention the falls at the end of the glen. First of all, THANK YOU. It was my first experience in a campsite and you made it just perfect. What more it was my honeymoon as well and you can imagine that I was a bit sceptic. The location is just breath taking and the service is excellent. Well done! Keep it up and hope to visit you as soon as possible. Have used this site 6 times in the last year after purchasing a camper. Can't praise the site highly enough. On arrival you book in and are usually met by Margaret, one of the most friendly and helpful people I have ever met on a site.There's plenty of space whether your in a tent, caravan or motorhome. The facilities are modern and immaculate at all times. There's an excellent shop come reception which stocks everything you might need. There's the added luxury of Internet access for those who need to be online even on holiday. I have noticed in other reviews that this site is regarded as expensive, all I can say is you get what you pay for and this is a 5* site. For those on a budget its well worth a visit early or late season when the price is more competitive. Oops.nearly forgot to mention the all important fact that you are at the foot of Ben Nevis and the views are simply stunning ! We've been to this campsite often but gave it a miss this year as it's a bit expensive! 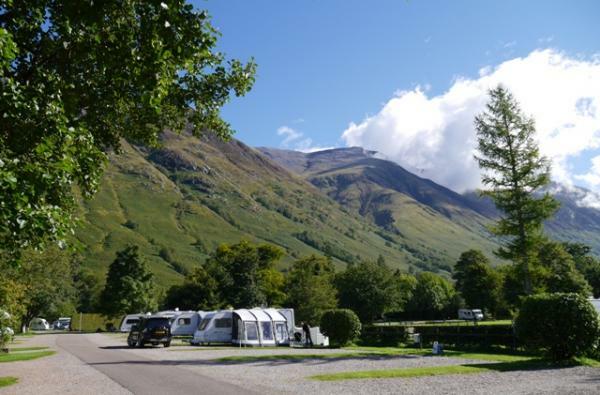 However, it is a great campsite and well situated if visiting Fort William and the surrounding area or climbing Ben Nevis! Last year we paid £15.50 for a tent, a car and 2 people. Its the most expensive camp site ive been on but ive given 5 stars for value for money because it has the best toilets and washing facilities and so i didnt mind paying a bit extra. i was not stung for a booking fee as we just turned up without booking, its a big site and if you just want a wee corner for your tent then booking isnt necessary. i dont know much about kids facilities as not having any i didnt look. the kids i did see seemed to be amusing themselves in a stream and having fun anyway. This was my first camping holiday since childhood and I feel totally spoilt. The scenery was magnificent. The site was lovely, didn't feel as big as it actually was. The showers and toilets were clean and no matter what time you visited the water was piping hot. We found the on-site burger van very useful and the restaurant although a little pricey was lovely. I would thoroughly recommend this site, I think we will be hard pushed to find another as good. Nice campsite but i paid a £10 deposit which is not refundable so worked out at £42 for two nights for the both of us. A bit pricey for my liking. otherwise facilities good and kept nice and clean. Excellent park, though squelchy underground if you don't get a hard-standing. Fantastic showers. Very clean toilet block, but not very warm (we stayed in October). Great setting, and only 5 mins drive from the town. Poor play area for kids, though, and no indoor games room. We stayed for two nights and caught heavy rain. It was a nice campsite. We found the groups of youngsters a bit loud but as soon as the campsite curfew started, it was so nice and quiet! the view of Ben Nevis was breath taking! Found this to be an excellent site and great scenery, Pitches were well-spaced and you generally can pick your own, rather than being allocated one! Plus points: Shower facilities best I've encountered - spotless, plentiful and well-designed - including an elevated "dry area" in the showers to get your feet dry! Camp shop stocked with all the essentials. I also found the site to be quiet - got a great night's sleep. Minus side: Very little for kids - a rather antiquated and muddy playpark is all really that appeared to be on offer - some form of games room would make it perfect! Fort William has plenty of facilities though - if you bring a car its 5 minutes away - otherwise a 20 min walk. Only other gripe - I imagine that parts of this site will get really muddy in the West Coast rain! I went dring a rare dryish spell this summer and things were still a wee bit squelchy underfoot. Suited the ubiquitous midgies! In general, I'd say one of the best there is and a must if walking is your thing. Think twice only if you have kids and no car (unlikely)... I'd also say, pick yor pitch wisely if it's going to be wet and take the midge spray in the summer months. I'll certainly go back. We stopped on the campsite for 2 nights. Had a nice time, we thought that the £10 booking fee was excessive though, taking what would have been £19 per night to £24. The dog walk was a bit of a nighmare, extremely wet and dodging tents to get there. Facilities as ever good with excellent scenery, but we won't be using them again. Just had another great stay at this Park. Great facilities and Staff helpful and friendly. A special thanks to Margaret in the Shop and Sandy (maintenance) Your help was much appreciated! Quiet time from 11-8 spoiled by neighbour playing his radio for all to hear, so thanks to the Warden for dealing with the problem, and giving us all a good nights sleep! Just spent a few nights there very peaceful nights sleep was had thanks to the no noise after 11 policy , toilets and shower block are cleaner that some hotel rooms we have stayed in, we will visit again soon, be warned if your going make reservations before you set of as its a very busy site in a very scenic glen. Heading back to one of the most stunning and well run campsites for the third year. Brilliant in all aspects including views and surrounding area. Midges never a real problem. Keep up the good work. Was the first place I ever visited. Absolutely fantastic. Peace and quiet, stunning views, and the best part, nightime security patrols. Play park for the kids, a well equiped shop, frindly staff. What more could you ask for. My vivit was in late April, fortunately out of midge season. 10 of 13 found this review to be helpful. Simply one of the best that i've visited. Magnificent view of the surrounding mountains. Facilities are 1st class and the latest toilets/shower/kitchen/laundry building is just superb. Defeinitely will re-visit. The location for this site has got to be one of the best in Scotland, surrounded by stunning mountains. 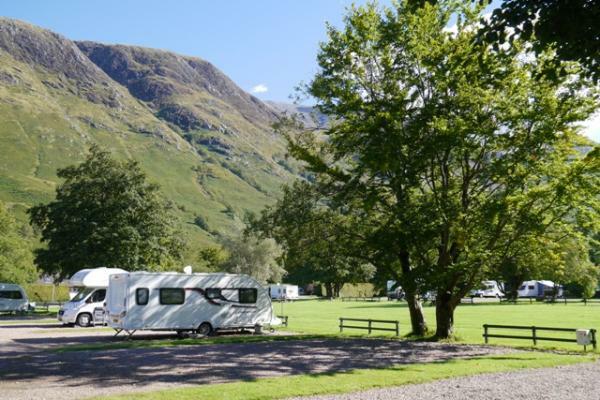 A few people have mentioned the great view of Ben Nevis, however the Ben cannot be seen from this campsite as its further back from the mountain opposite. We hit it off with the weather as the weekend of 10th and 11th June 2006 saw temperatures of 28 degrees. Midges were not too bad, saw a lot worse. The "noise Police" on site are a bit over zealous, we were simply talking, around midnight, and were told to keep quite. We continued to whisper for a bit then gave up and went to bed. The facilities are adequate and well maintained. Great Views. Quiet and tranquil. Good showers. Plenty of room. Well recommended and would visit again. Plenty of rain too. by Tentastic from London alas. Been here a couple of times. It's nice enough but both times i've been the pitches have been somewhat damp. Great centre for activities. Midges are some of the worst i've had to endure, thankfully the, rather austere, on site pub came to the rescue. Would modestly recommend. Have been eight times.if your looking for peace and tranquility thats what you will find.Town of fort william nearby and fast food outlet and large supermarket.Beautiful views scenery and plenty walks to go on.the only bad point is it always rains when we go.this has never spoiled our time there as it is just so peaceful. Yes, the rain is definately wet in Glen Nevis and there is a lot of it!! Stayed 2 nights and left because we were fed up getting soaked every time we went outside. However the site itelf was very good, good facilities, showers toilets etc, well kept and with a good restaurant and bar. Only bad point was we were wakened up at 3 am by some drunken yobs looking for their tent - this could b an issue for this kind of site, there again maybe we were just unlucky. Will try the site again when the weather forecast is better. Arriving from Inverness pulling my trailer on my pushbike I found this campsite a site for tired legs. I was very impressed by the layout and the fact that the reception and shop was still opened at 8:45 pm. I paid my very low fee for such a fantastic service from the friendly staff that made me feel at home straight away. The pitch area was just the business and the view of Ben Nevis was out of this world. The site was very laid back and quite even though there were a lot of people there. The services, which included the toilets, showers and little supermarket on site, were absolutely top class. I could only stay one night but I will return to the site every chance I get. Well worth cycling 70 miles pulling a 6 stone trailer. The one drawback at this site and this would be the same for nearly every site on the west coast of Scotland is the Scottish midges. Remember to take some repellent, speak to your pharmacist and buy a head net, which the campsite shop actually sell. If it is a little windy then you will be ok. The beauty of the campsite far outweighs the little problem with the midges. Well worth the money and a visit to the site. We came here for 1 night end up staying six. Great views of Ben Nevis, take some binoculars and follow the hardy souls up to the summit. The site its self is of several different fields supect so it does look to open. The pitchs are on the large side and level. Loads of room for folks in tents. The staff are friendly, loos are clean, and even the camp shop is very reasonable. We would avoid big site like the plague but found this one very enjoyable, will use agian but not in school holidays. This site is the best campsite i've been to! It is spacious and well-equiped. It has excellent pitches and handy placed hook-ups. The shower/toilet block is big and clean with regular inspections. Family/dog friendly place, but also strict rules about night-time noise so peaceful too :) Good shop and snack bar. Also has fancy restaurant attached to it - The food there is gorgeous!! FANTASTIC VIEWS OF BEN NEVIS!! 28 of 35 found this review to be helpful.